The Multicultural Centre of Southwest Florida tries to help as many kids and families as possible each year with their back-to-school needs. If you and your family are in need of our help this year, please join us at our Big Backpack Event, Back-To-School Festival & School Supply Giveaway on Sunday, July 28, 2019, from 10 AM - 2 PM at our new location this year, Fort Myers Skatium Rink in Fort Myers. The first 2,000 Lee County elementary school children ages 5-12 who pass through line will be given a ticket and hand stamp to receive a free backpack and school supplies that include notebook paper, crayons, pens, pencils, folders, and glue. The more money we raise, the more children we can help. 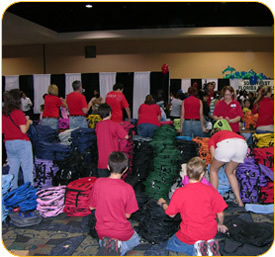 Children must be present with an adult or guardian to receive the free supplies and backpack. Backpacks and school supplies will be given away on a first come, first serve basis, while supplies last. Families and children who attend the event will also be able to visit several vendors and may receive free eye exams, finger printing, face painting, haircuts, and other giveaways throughout the day.